AMMONNEWS - Algerian President Abdelaziz Bouteflika is preparing to announce his resignation this week, local media said, after weeks of popular mobilisation against his rule and calls by the military that the ailing leader is removed. The reports by Ennahar and El Bilad TV channels came on Sunday, a day after Lieutenant General Ahmed Gaid Salah renewed his call for the application of a provision in the Algerian constitution that could remove the president on account of his failing health. Under article 102 of the constitution, the Constitutional Council can determine that a sitting president is no longer fit to assume his duties and, pending parliamentary approval, proceed to declare the presidency vacant. "We must adopt a solution that helps us out of this crisis … a solution that respects and adheres to the constitution so that it's a suitable one for all sides," said Salah, who is also the deputy defence minister, in a televised address on Tuesday. Algeria's presidency on Sunday announced the formation of a new caretaker government headed by newly appointed Prime Minister Noureddine Bedoui. Analysts believe that the reshuffle was done in anticipation of article 102's activation, after which no changes can be made to the government until a presidential election is held. The weeks-long demonstrations erupted in late February after the 82-year-old president announced his plan to run for a fifth term in elections scheduled for April, bringing hundreds of thousands of demonstrators onto the streets. Amid the mounting public anger, Bouteflika later gave in to protesters' demands and abandoned his re-election bid. But he also delayed the presidential vote indefinitely and announced he would only step down once a new constitution had been passed and a successor had been elected. 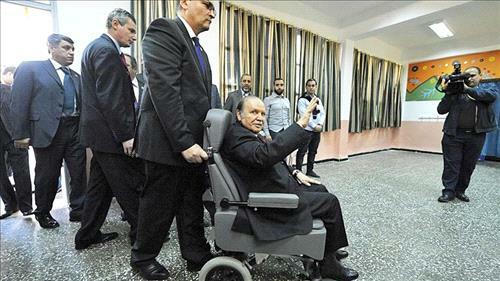 After suffering from a debilitating stroke in 2013, Bouteflika has in recent weeks seen some of his closest allies, including ruling party executive and trade union leaders, abandon him. Addressing an Arab League summit in Tunis on Sunday, the United Nations Secretary-General, Antonio Guterres, welcomed efforts towards a peaceful and democratic transition in Algeria.